This winder blows us away. It is in fact a showpiece, and an amazing piece of technology. 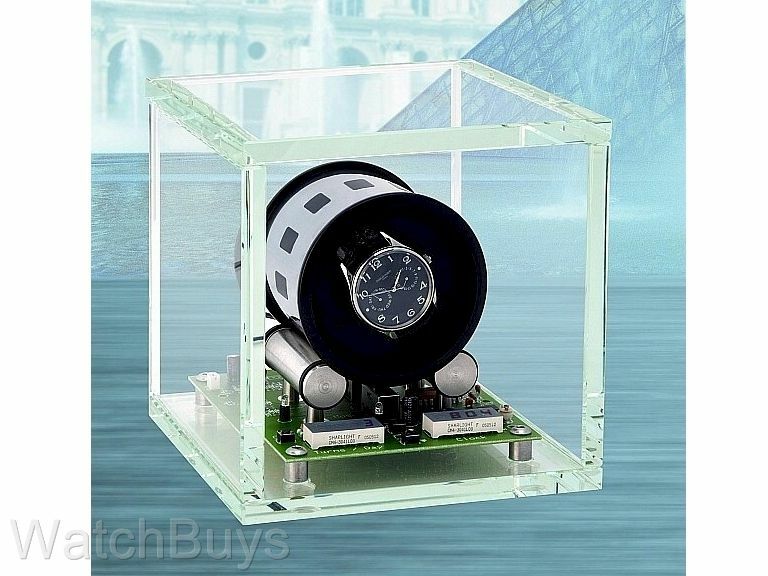 The Tourbillon watchwinder couples innovative watchwinding technology with futuristic appearance. An ironless core Swiss micromotor is concealed within one of the two ball-bearing fitted stainless steel support rollers. Seated on those rollers is a rotating plastic lined stainless steel hollow cylinder into which the watch is mounted on elastomeric self-conforming cushions. There is no metal-to-metal contact as the drive rollers are equipped with nitrile rubber drive rings at both ends. Controls are provided on the circuit board for 4 different turns per day (TPD) settings (650, 800, 950 and 1300). The ON/OFF control is combined with a 4-position switch which allows clockwise, counter-clockwise operation (the 4th switch position is unused). Lighted LED digital displays are provided for extremely accurate quartz-based 12-hour time (AM and PM) and the turns per day indicator is the other 4 digit LED display which resets to zero automatically at midnight. Push button controls are provided for setting the time and clearing the turns per day register. Four (4) blue LED lights are provided solely for interest and are programmable for various flash rates. One of the most notable features of the Tourbillon watchwinder is its ability to make any mechanical watch, in effect, a tourbillon watch. Each cycle, or turn of the winder, ends up with the watch positioned in a new incremental position. For example, a watch in its mounting cup rotates 390º in each cycle and then comes to rest for a short period of time. The succeeding cycles each repeat the 390º rotation resulting in 30º steps. After 12 cycles the watch has circumscribed a full 360º. This action, like that of the tourbillon within a wrist or pocket watch, cancels out the effect of gravity on a watch's balance wheel mechanism. Supreme accuracy is assured when the watch remains on the winder for extended periods. The Tourbillon is provided completely assembled in a 3/8" thick crystal glass enclosure which allows viewing of the operating mechanism and the lighted displays, and packaged to prevent damage in shipment. The unit is supplied with a universal AC/DC adapter for 110/240 VAC, 50/60 hz, and a 6-foot cord.